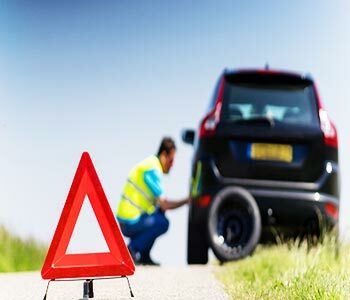 When you have a car, there will be routine maintenance checks on the car. In order to achieve this, you would need a floor jack. 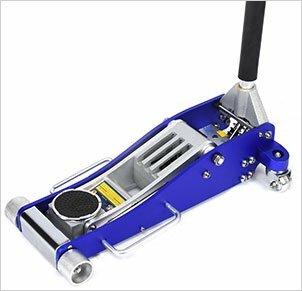 If you have a sports car or any the high performance cars with a low profile, then you will need to find a low profile car jack. You will realize that one of the key considerations when buying a floor jack is the type of the vehicle that you will be lifting. As such, when you have low cars, you will need to find the right jack for that purpose. There are so many different models of a low profile floor jack on the market and one may be confused on the right one to buy. However, with our guide, you will be able to make an informed decision on the best floor jack. One of the biggest advantages with the low car jack is the fact that they can easily slide under the ground hugging vehicles, without a problem. You will be able to conveniently use it to hoist your vehicle to a comfortable height so that you can access the underside of the vehicle. As you may have already established, there are tons of low profile jacks on the market. Each of the manufacturers claims to have the best model. Here are comprehensive reviews on the best low profile car jacks. The Neiko Pro 20272B 3 ton floor jack will be able to lift loads of up to 3 tons and stands out as one of the best floor jacks in its category. It is made of superior quality aluminum alloys and as such, you can be assured of its longevity as well as strength. It is also light and as such, you will move it around the garage as you would please without too much difficulty. If you want to find a low Profile car jack that has great functionality, then this would be a great choice. The minimum height of the Pro 20272B is 3 ¾ inches, which makes it pass as a great choice of a low profile floor jack. The saddle will rise to a maximum height of 19 ¼ inches, which is quite remarkable, as it has a very wide lifting range. When it comes to lifting loads, you will be able to accomplish this without much difficulty as it has a double plunger that enhances the lifting mechanism on this floor jack. The safety valve on this low profile aluminum floor jack is a safety measure to protect the hydraulic system. This will prevent the overloading of the floor jack and ensure that it is being used within the rated parameters. There are rear casters, which swivel and help in moving and position of the floor jack. The casters are made of steel and as such, they will enhance the stability of this floor jack. 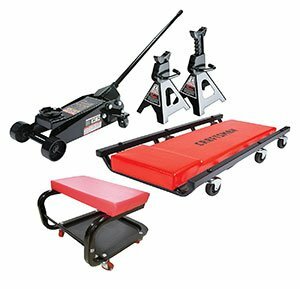 This is certainly one the options to consider if you are looking for a great low car jack. There is a dual plunger feature on this low profile aluminum floor jack and as such, you will be able to lift loads with very little effort. While the floor jack weighs about 57 pounds, it has the capacity to lift loads of up to 3 tons, without a problem due to its solid aluminum construction. 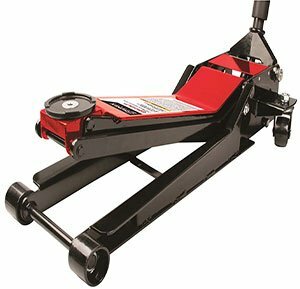 The lifting range of this 3 ton floor jack can is 3 ¾ inches to 19 ¼ inches. The minimum height is what makes it pass as a low profile flow jack. The saddle on this low profile jack has a dotted rubber pad, which will enhance the contact with the load and avoid any slippage. It also protects the frame and other parts of the vehicle from any form of damage. It comes with a safety valve which will protect the floor jack from being overloaded beyond its capacity. If you have a vehicle that weighs 3 tons and below and has a low profile design, then this would be the ideal low profile floor jack to consider. With a minimum height of 3 ½ inches, you can easily slide it under the lowered cars, without a struggle. You will be able to lift loads all the way up to 19 ¼ inches with this aluminum racing jack. Any vehicle that has a low ground clearance needs such a floor jack to hoist it up. It is made of aluminum and this has a quite a number of advantages, with the main ones being the fact that it is quite light to carry and move around. Additionally, the aluminum construction makes it is strong and durable and this why it can support loads of up to 3 tons without a problem. There is a unique saddle which swivels and rotates to 360°. This means that you can adjust the floor jack easily without having to remove it from the underside of the vehicle. The handle of this 3 ton aluminum floor jack is made up of 2 pieces and will measure 50 inches long when assembled. It has a knurled up grip that will prevent any chances of slipping while in use. The floor jack comes with side handles which can be used to carry or move the floor jack. The hydraulic system is also tightly so as to prevent any cases of having the hydraulic fluid being contaminated. The safety valve is a protective measure to ensure that the floor jack is not used beyond its rated capacity. The aluminum racing jack is made of high grade aluminum and this makes it light, sturdy and durable. 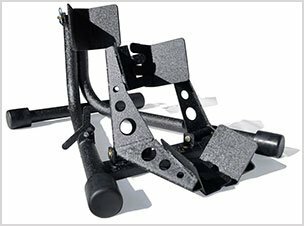 This low profile car jack has a minimum height of 3 ½ inches, which makes it possible to use it on lowered cars. The maximum height is 19 ¼ inches allowing you lift different types of vehicles. 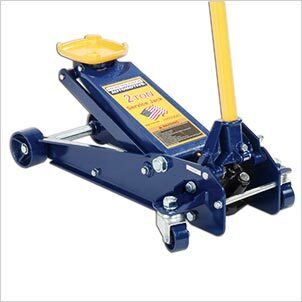 You can use this 3 ton aluminum floor jack to lift loads of up to 3 tons. With the safety valves on this floor jack, you will not have to worry about over pumping or issues of overloading it. The saddle rotates to 360° and also swivels, which makes it easier to position the floor jack, without a problem. 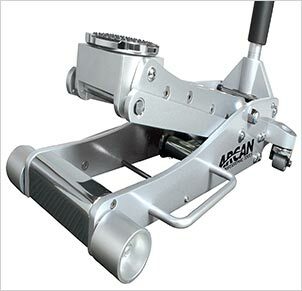 Arcan is a renowned brand when it comes to floor jacks and the Arcan XL2T is one such floor jack. This is a remarkable model that is truly a low profile jack as it has a minimum height range of 2 ¾ inches. For those with racing machines or the sports cars, you will really appreciate the low profile design as the floor jack will be able to fit under the vehicle without a problem. The maximum height achievable with this jack is 24 inches. With this floor jack, you can be able to lift a wide range of vehicles. This is a 2 ton floor jack and this will allow you to lift loads of up to 2 tons conveniently. Most vehicles are within this weight range and therefore you can make use of this model to raise your vehicle for routine checks and maintenance. As far as the quality goes, this model is a reputable manufacturer and in addition to this; it meets all the ASME PALD requirements. As such, you can be sure that you have the right low profile car jack to use on your vehicle. You will realize that this floor jack is quite heavy as it weighs 97 pounds. 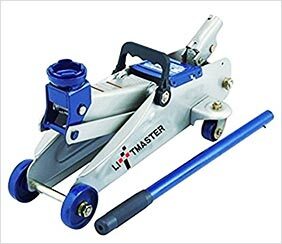 While this may be bad for those who want to move the floor jack around, it is a great thing when it comes to the strength and stability of the floor jack. The dual pump system facilitates the fast rising action and also speeds up the process of lowering the load. This Arcan XL2T floor jack comes with a dual pump, which will facilitate the rapid lift process and can lift loads of up to 2 tons. This low profile jack has a minimum height range of 2 ¾ inches and can go all the way up to 24 inches high. This means you can use it on lowered vehicles as well as vehicles that require a high lift jack. The floor jack is made of high grade steel and complies with all the provisions of ASME PALD 2009, which means that you can trust its quality. The universal joint release mechanism on the 2 ton floor jack will give precision when it comes to loading control. With the extra long chassis, you will be able to place the jack on areas that may be hard to reach, ordinarily. If you have heavy vehicles that weigh more than 3 tons, then you should consider the Performance Tool W1627 low profile jack. This is a floor jack that has the capacity to lift loads of up to 3.5 tons. The 3.5 ton floor jack can be used for heavy duty tasks that will require lifting very heavy loads off the ground. 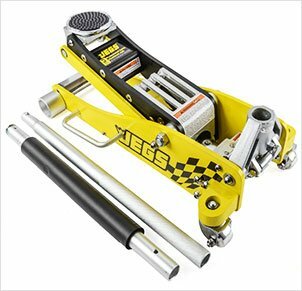 With a minimum height of 4 inches, you can use this floor jack for lowered vehicles and be able to lift them all the way to 20 ½ inches high. This gives you adequate clearance to work underneath your vehicle. The floor jack weight 85 pounds, which is a great advantage as much as it is not as light as other models. The good news is that it will be steady and will not wobble when you are using it to lift your loads. This is a very powerful floor jack and has wide side flanges which will enhance the strength and stability of the floor jack. If you are looking for a stable floor jack, then you should consider getting this particular one as it will last longer. The dual piston pump is responsible for the speedy lifting of loads using this service jack. It comes with a rubber saddle that will enhance the grip with the load and prevent any chances of slippage. This is a floor jack that is highly rated due to its versatile features and you will find it quite impressive when you choose to buy it. There is a safety valve that will protect floor jack from being overloaded and therefore prolong the life of the floor jack. The steel casters will help in moving and positioning the floor jack and also help in boosting the strength of this floor jack. The 3.5 ton floor jack has a dual pump that will provide a fast rising action, making it easier to lift loads. As a safety measure, there is an overload protection valve as well as bypass devices. This prevents any cases of over pumping and overloading of the floor jack. There is a rubber pad on this floor jack which will protect the frame of the vehicle and other components from being damaged. 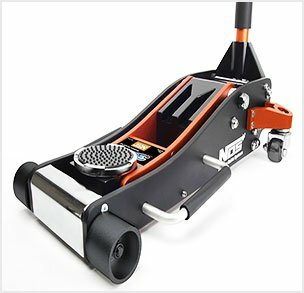 The swivel casters at the back and the fixed wheels at the front are made of steel, which enhances the stability of the floor jack. 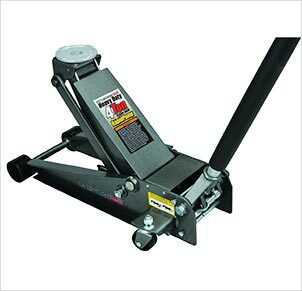 The flanged steel frame makes the service floor jack quite sturdy and enhances the durability. For anyone that has a vehicle with low clearance, you will need to have this floor jack. 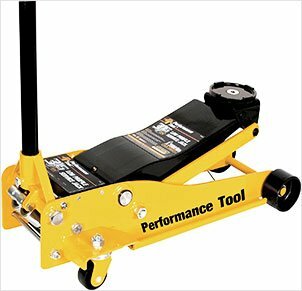 The Forge 200T is a very powerful floor jack and a great low profile car jack. The floor jack is exceptional in various ways and has a number of versatile features that you will find useful. It has the capacity to support loads of up to 2 ton comfortably. This makes it easier to be able to access the underside of your vehicle without straining. This is one of the best models that you will find out there. The single piece handle is well padded and has a rugged feel. As such, you will have a comfortable grip that will also alleviate the fender dings. The padded protection will also protect the vehicle frame and other elements from any form of damage. The tough powder-coated finish will prolong the lifeline of the floor jack and cause it to last for a very long period of time. The American Forge floor jack will not disappoint you in any way and you will love every feature of it. There is a quick lift mechanism as the floor jack has the double pump technology incorporated. If you are looking for a true low profile jack, then this is the best option as it has a minimum height of 2 ¾ inches and will rise all the way up to 20 inches. Ultimately, you will be able to lift vehicles with minimal effort. The saddle is also padded and this will protect the vehicle and also make the grip on the load firm to prevent slippage. Being an American floor jack, you can be sure of the quality. The double pump technology on the Forge low profile jack allows you to lift your load with the least effort possible. This is responsible for the rapid rising of the floor jack. The minimum height is 2 ¾ inches making it able to lift vehicles that have an extremely low ground clearance. The maximum height is 20 inches high. The universal joint mechanism on the American forge floor jack will give you precise control of your load when hoisting it. The padded saddle will protect the frame of the vehicle and other components on the underside of the vehicle. These extra long handle will make it easier for you to place the floor jack in hard to reach places under the vehicle. How To Operate The Low Profile Car Jack? When you have a low profile jack, you can be able to use it for various tasks like changing tires, routine checks and so much more. Before lifting your vehicle to the floor jack, you should ensure that the vehicle is parked on a flat surface and a ground that is solid enough to support the load, without sinking. Finally, ensure that the parking brake is engaged before jacking up the vehicle. Activate the hydraulic system, which facilitates the lifting process. This is done by closing the release valve completely and you can do this by twisting the floor jack handle the clockwise direction. Place the floor jack underneath the vehicle and ensure that the saddle is directly under any of the marked jacking points. Pump the handle in slow motions until the saddle reaches the load and then start raising the load. Keep checking if the floor jack is well-positioned so that you can align it if there is a problem. When the load gets to the desired height, place jack stands and ensure that they are able to support the load. Lower the vehicle and let it sit on the jack stands and then remove the floor jack. Open the release valve by twisting the handle in the counterclockwise direction. This will start lowering the saddle, which should be done in a slow motion so as not cause a shock load on the jack stands. Remove the jack stands and then lower the saddle all the way to the resting position. At this point, you can remove your low profile car jack from the underside of the vehicle. 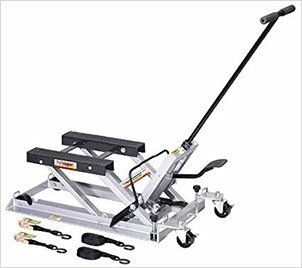 Lifting Capacity: You should consider the weight of your vehicle and if the floor jack has the capacity to support your vehicle. This is a critical factor as it enhances your safety when you get the right floor jack. Materials: The best floor jacks are made of aluminum or heavy duty steel. 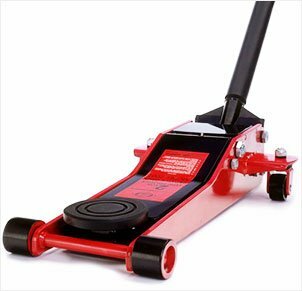 You should avoid floor jacks with plastic parts as they tend to compromise on the overall quality of the floor jack. Lift Height: Getting a low profile floor jack means that you have a lowered car. You should be sure of the minimum height or the ground clearance of your vehicle before buying a particular floor jack. Lift Speed: How many pumps will it take for you to get the saddle to the maximum height. Go for models that have a rapid lifting technology. This is made possible by the type of pumps they have. Price and Warranty: This is also an imperative consideration as it will help you pick the right model within your price range. The warranty, on the other hand, will give you an idea of the quality of the floor jack. Buy a low profile car jack with the longest warranty period and a reasonable price. If you have come this far, it means that you have gathered adequate information to help you buy the best low profile floor car jack. 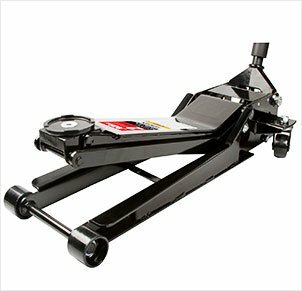 From the models we reviewed above, we highly recommend the Arcan XL2T Black Low Profile Steel Service Jack – 2 Ton Capacity due to its unique nature. It has a minimum height of 2 ¾ inches and this makes it a true low car jack. We believe our guide will help you make an informed decision. Please do not forget to share this guide with your friends and loved ones.